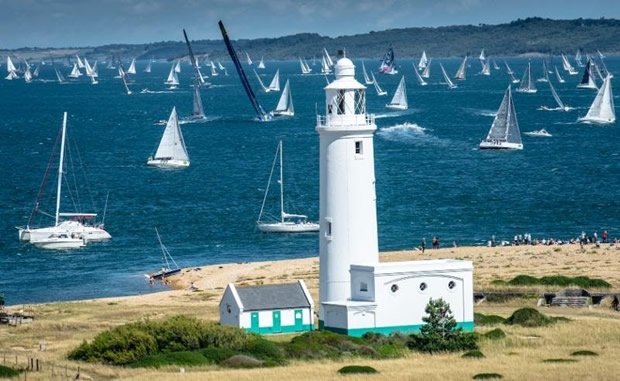 Two months out from the start of the Rolex Fastnet Race, the Royal Ocean Racing Club has made public the latest entry list for its biennial 600 mile race from Cowes to Plymouth, via the Fastnet Rock, starting at noon on Sunday 16th August. The entry list makes for impressive reading in terms of scale, diversity and quality of the fleet taking part, confirming the Rolex Fastnet Race's position as the world's biggest and most popular offshore race by far. As of today there are 387 boats entered with a further 74 on the waiting list. If all the boats currently entered were put bow to stern, the line from Cowes would stretch two thirds of the way across the Solent to the mainland (1635.75m). The bulk of the fleet - 340 entries to be precise - are competing under IRC for the race's overall prize, the Fastnet Challenge Cup. With the two American maxis: Jim and Kristy Hinze Clark's 100ft Comanche and George David's Rambler 88, due to be the pace setters on the water, the IRC fleet will, in due course, be divided into classes and class sub-divisions. The remaining 47 are not competing under IRC but represent some of the world's leading professional race boat classes. These include the latest generation foil-born IMOCA 60s, lining up for their first major event in the build-up to next year's Vendée Globe, plus a large and highly competitive fleet of Class40s. Then there is the 13 strong multihull class featuring Dona Bertarelli and Yann Guichard's 40m long trimaran, Spindrift 2, the world's fastest offshore sailing yacht; as Banque Populaire V in 2009 she covered 908.2 nm (ie 50% further than the Rolex Fastnet Race course) in 24 hours at an average speed of 37.84 knots and in 2011, set the Rolex Fastnet Race multihull record. The average size of yacht competing in this year's Rolex Fastnet Race is 44.34ft (13.52m) with Spindrift 2 being the largest multihull, Comanche and Leopard the longest monohulls at 100ft and at the smallest end of the fleet, three 30ft yachts including Myles and Ashley Perrin's Capo 30, Santana from California. In IRC rating terms, Comanche and Rambler 88 lead the charge with Time Correction Coefficients (TCC) of 1.973 and 1.869 respectively, while the slowest boat in the fleet is Tony Harwood's Nicholson 38, Volante, on 0.864 (the minimum permitted TCC this year is 0.850). An impressive 52 entries are sailing two handed, up from 45 in 2013 when the race was won for the first time in its history by a two handed crew: French father and son, Pascal and Alexis Loison aboard their JPK 10.10, Night and Day. Hoping to emulate the Loisins' performance this year is another father and son crew, Derek and Conor Dillon from Listowel in southwest Ireland, who are competing on their Dehler 34, Big Deal. Despite owning the boat for 10 years and campaigning her in many regattas in Ireland, the Dillons have only recently ventured into offshore racing, but nonetheless won the Two Handed class in last year's Round Ireland Race. With the Fastnet Rock on their doorstep in Kerry, the RORC's flagship event was an obvious ambition. "Every year we are trying to go bigger and bolder. This is an opportunity to compete in a legendary race against the best the world has to offer as well as, of course, making lifetime memories together. There are some seriously talented sailors in this race. You can give it your absolute all, and still not touch the leaders." Among the present line-up 180 boats will be competing in the race for the first time, while 163 took part in 2013. Some of the most regular participants are Dutch old hands such as Piet Vroon, winner of the race in 2001 and, at the tender age of 85, back this year with his latest yacht, Tonnerre 4. Then there's Harry Heijst who has raced his classic Royal Huisman-built S&S 41 Winsome in seven Fastnets, the first back in 1999. "The most memorable Rolex Fastnet Race for us was in 2005 when we won Class 2 and came fourth overall," recalls Heijst. "We were looking good for a first overall until three Class 4 boats suddenly got a lot wind at the Lizard and beat us in." Celebrating its 90th anniversary in 2015, the RORC, for the first time, gave their members priority entry to the race. RORC Commodore Michael Boyd expressed the delight of the club at the overwhelming interest in its flagship event: "Naturally, we are delighted with the enormous interest in the 2015 Rolex Fastnet Race. We now expect almost 400 starters and may have to disappoint many currently on the waiting list. Of course, there is a way to avoid a let-down in 2017...join RORC! I will be aboard Peter Rutter's Grand Soleil 43, Quokka 8, in IRC 2 as we continue our 'joint adventure' and we hope to have our cruising boat, Southerly, to welcome finishers in Plymouth."